Brewed with organic roasted barley and chocolate malts for a rich, dark and robust flavor with an infusion of organic vanilla beans and coffee from the Dominican Republic farm community Alta Gracia. This beer pours dark brown almost completely opaque with just a hint of color at the bottom edge of the glass. Wow, do you want some beer with that coffee? The nose is all coffee, and I mean COFFEE! With just a gentle swirl there is also some dark roasted malts and a sweet note that I can’t put my finger on, possible a light hop note or vanilla. What ever it is it’s getting lost in the coffee. Sweet roasted malts upfront, then a nice creamy mouthfeel in the middle of the sip. The back end and finish has a slight bitterness but it’s more of a roasted malt and espresso bitterness rather than a hop bitterness. The final aftertaste is of roasted malts and coffee with some chocolate notes but once again mostly coffee. I can’t tell you how surprised I am. Not that this beer tastes like coffee but that I like it so much. I like dark roasted beers but I usually don’t like coffee adjuncts in the beers. I do like the natural coffee and chocolate notes that come from the roasted malts. Usually the coffee adjuncts just add and artificial coffee taste and sometimes an odd bitterness that just does not seem normal for a beer. As this warms it just gets better. The rich roasted malts are leaving a creamier mouthfeel. I may also be picking up some of that vanilla sweetness now. This is an excellently well crafted and natural tasting beer. 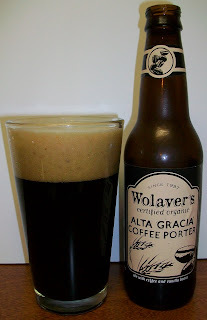 It is a very good American Porter with natural coffee flavors. My only problem with this beer is that the coffee flavor is the most predominate flavor. The coffee flavor is superb but I think it is just too much for the beer. This beer does not have that coffee bitterness that most beers that are brew with coffee in them have. This is the best coffee flavor I’ve ever had in a beer. The flavor is more like a whole coffee been flavor not a bitter ground coffee flavor. Even the nose smelled like whole roasted coffee beans not a cup of coffee. I suspect that the “infusion” that they talk about on the label is just that. An infusion of whole coffee beans not ground coffee added to the brew kettle. Here’s my dilemma. This may be the best coffee flavor I’ve ever had in a beer but I think it’s just too much for the beer. There are probable some nice roasted malt characteristics that just never got a chance to come out and play. They were completely dominated by the coffee. I also had to struggle to find the vanilla in this beer and I’m not really sure I did. As it stands I’m giving this a B+. This is a very good beer. With a little less coffee and more dark roasted malt and vanilla flavors and this would be an A+, easy. In my humble opinion it just needs a little tweaking to be an outstanding beer. I’m going to keep my eye on this beer and purchase one periodically to see if there are changes from batch to batch. Wolaver's has a winner here and with just a little tweaking it could be out of this world. Nice review. I'm glad you liked it! Man, and I forgot to mention the good friend who gave me the beer. It's a good find G, I'll be having this one again.